Is military spending good for economic growth? According to some studies, the answer is affirmative. Military spending boosts business confidence, particularly in conflicting countries, which facilitates physical investment and economic growth. Others find that government spending on military hardware lowers macroeconomic growth as it crowds out social expenditures and investment in economically productive sectors. The lack of systematic evidence implies that policy decisions relating to military spending need not consider the associated economic costs and benefits. However, there are at least two methodological reasons for which past evidence remains contested. First, the growth payoffs to military spending are likely to be contingent on the nature of conflict. After the collapse of Soviet Russia, the world entered into a new era of threats arising from rogue states, transnational territory networks and regional conflicts. Although armed conflicts between nations declined, countries continued to spend on defense due to various latent external threats, intra-state armed confrontations between the governments and organized opposition groups are very common today. Yet most researchers in the past did not differentiate between external conflict and internal (i.e. civil) war. Second, the size of military expenditure is also positively influenced by income level as much as it may predict the rate of macroeconomic growth. This problem of 'reverse causality' is often ignored by researchers leading to conflicting results. In the post-Cold War era, many developing countries in East Asia graduated into middle and upper middle income status, gaining greater fiscal capacity to spend on military hardware. While for Eastern Europe and the US spending declined (see Figure A), substantial increases were recorded for Asia and the Middle East. The steady rise in military spending in Asian countries despite the recent slowdown in economic growth in the region therefore again raises the question – are governments in the region doing the right thing by spending millions on defence? One way to answer this question is to investigate the macroeconomic growth performance experience of all developing countries that are in conflict vis-à-vis those that are at peace in the post-Cold War era. In a paper co-authored with Professor Nusrate Aziz of Algoma University and recently published in the Journal of Economic Studies, I do exactly that using data from 70 developing countries. The analysis covers the post-Cold War period of 1990–2013. In terms of methodological framework, I apply a dynamic non-linear panel approach which helps capture the causal impact of military expenditure on economic growth in the presence of internal and external threats. I find that differences in methods, model specifications, and the underlying estimation sample partly explain why past studies have differed in terms of the true effect of military spending. The main estimates are based on the generalized method of moments (GMM) regression model. But for comparison purposes, the authors also report estimates using fixed and random effects as well as pooled cross-section regressions. Full sample estimates based on GMM, fixed, and random effects models suggest a negative and statistically significant effect of military expenditure. However, fixed effects estimate becomes insignificant for low-income countries. The effect of military spending is also insignificant in the cross-sectional OLS model if conflict exposure is not considered as an independent driver of economic growth. When the regression model additionally controls for conflict, the effect of military spending conditional upon (internal) conflict exposure is significant and positive. No such effect is present conditional upon external threat. In other words, my analysis supports the hypothesis that expansion in military expenditure is harmful for economic growth. Only in the presence of internal conflict does higher military expenditure fosters economic growth in developing countries. So governments in Asian countries, particularly those not facing any internal threats, may reconsider investing more in expanding existing military capacity. That said, tension is at an all-time high in the Korean peninsula. The deployment of an advanced missile defense system in South Korea by the United States has already raised concerns over a new atomic arms race in Northeast Asia. In the Southeastern part of Asia, an equally dangerous arms race can escalate if territorial disputes over the South and East China seas are not resolved soon. For smaller but wealthy Asian states, the fear originating from military ambitions of bigger regional neighbours such as China and India is likely to be the biggest driver of growth in military spending in the coming decades. Diffusion of tensions through greater regional dialogue therefore should be prioritised. Failing to do so may leave Asian countries trapped in a silent but costly arms race. I looked but could not find where it mentioned where(what country) the money was spent. If it was all spent in the country where the study was done, I would think that has a big influence on this article's conclusions. For example if the U.S. went to war with England and all our weapons were manufactured in Norway, I would assume Norway's economy would soar. 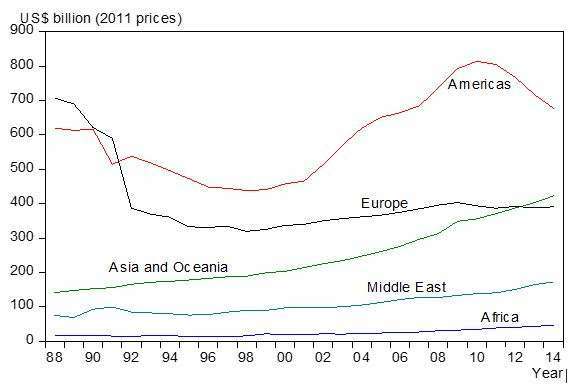 "While for Eastern Europe and the US spending declined (see Figure A), substantial increases were recorded for Asia and the Middle East." This verbal description of what has happened since the end of the Cold War in fact accords rather poorly with Figure A. Figure A shows an initial sharp drop in military spending for Europe and the Americas (the latter presumably mostly the USA), whereafter European spending is almost flat, while American spending soars to well above its Cold War levels, rising until around 2009, then falls back - but still ends above where it was in 1990. Meanwhile the rest of the world increased spending more steadily, with a slight acceleration. I appreciate that the research focus is on comparisons between Asian countries, but that doesn't justify mis-describing the overall picture of world military spending - especially as Trump appears to threaten a new arms race. especially as Trump appears to threaten a new arms race. Yes, that's what happens when we decide enough is enough.